I’m a feast or famine kinda girl, if you haven’t figured that out. When it comes to food the words balance and restraint don’t really come to mind. At all. Ever. The motto is a little more, ‘if it feels good, do it.’ While I certainly enjoy this way life, it is not without its’ drawbacks. It’s a pretty id-driven existence that can land you in the underworld of obesity…which is why I prefer to do these periodic healthy-esque eating benders. It’s either that or fat camp. I hope you’re ok with the veggie burgers, olive oil cookies and granola. This is as healthy and crunchy as I get. Just know that gluttony is mere weeks (if not days) away. I’m currently feeling exactly as I felt at the start of the school year: crazy and overwhelmed. Two kids at two different schools is pulling me in opposite directions and I’m feeling a bit like I’m not as involved as I like to be, anywhere, at the moment. Work and other responsibilities are holding me hostage…I think you know a bit how that goes? These burgers are perfect if you’re in that same mindset: feeling a wee chunky from winter and maxed out with responsibilities. They are super easy + quick to fix, plus most of the ingredients are things you’ll have lying around or that are easy to procure. 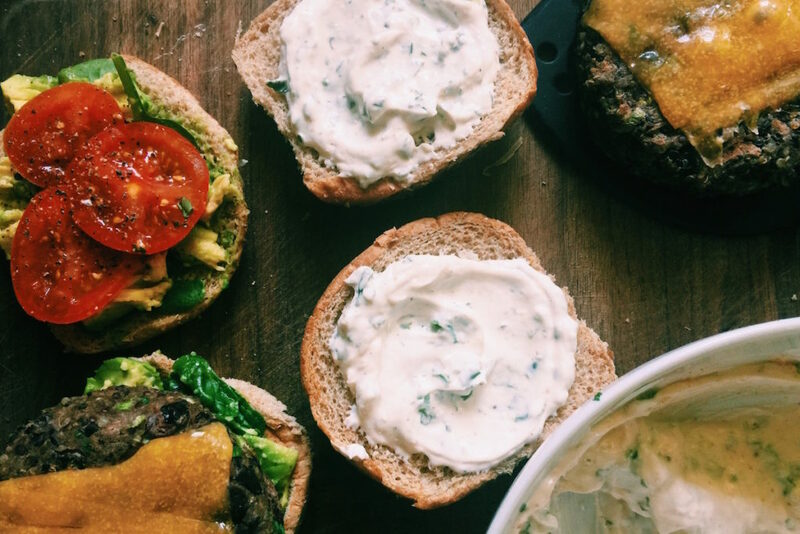 These burgers are also great to throw together at the start of the week, grill, wrap tightly and store in the freezer for lunches all week…a quick pop in the microwave and you’re done. They’re great in a bun…but I also really like them on top of a kale salad… OK, I need to go eat some cookies and steak and rediscover who I really am. Pour yourself some wine. 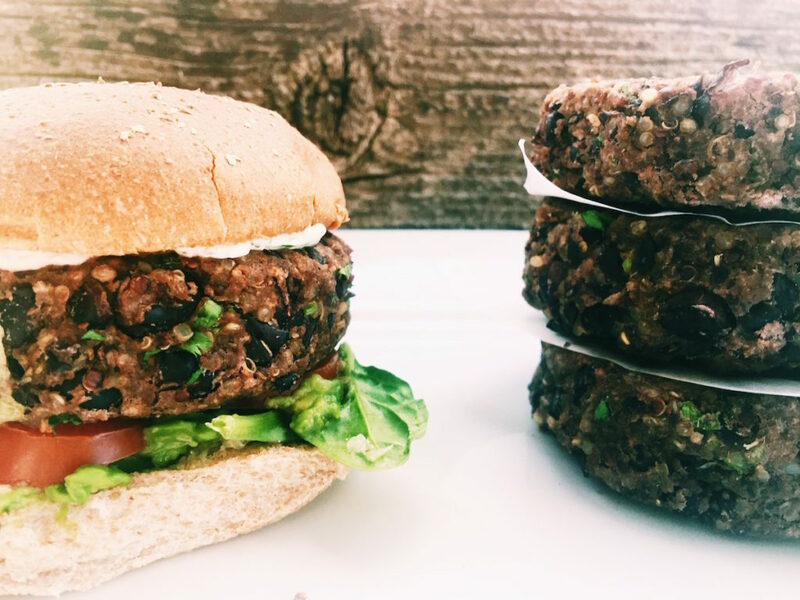 Something full of antioxidants to pair nicely with these uber healthy burgers. Your skin is going to be positively dewey post dinner. Make your secret sauce by simply mixing the Greek yogurt through the Tabasco in a small bowl. Set aside to let the flavors mingle and get to know one another. Dip your pinky in for a quick taste. The flavors scream out like a late-night cocktail party, don’t they? Or a Metallica concert, depending on how much Tabasco you threw in there. Meanwhile, put quinoa and black beans in a medium-sized bowl and mash with either a masher or the back of a fork. Leave maybe ¼ whole bean and the rest mashed…this will help everything stick together. Scramble the eggs in a large bowl. Put the quinoa and bean mash in with the eggs. Dump in the panko, cilantro, green onions, chili powder, green onions, cumin, salt and pepper, and fluff around with a fork. Gently shape into six equal-sized patties. Make sure that the edges are pretty vertical and even so that the burgers will cook evenly. I usually hold them in one hand and with the other sculpt using my thumb to build up the sides. Does that make sense? If you have the time, refrigerate for 30-60 minutes. This will make it easier for them to hold their shape. I tend to cook these in my grill pan rather than my BBQ because they turn out the nicest, I think. Whatever vehicle you choose to cook them, make sure it is well-oiled. 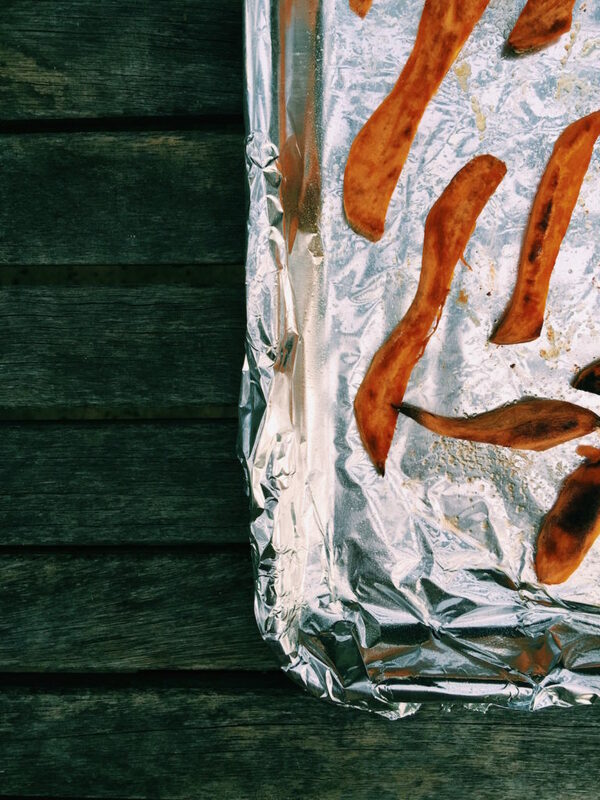 While the burgers are chillin’ in the fridge, get started on your sweet potato fries. Cover a large baking sheet with foil and spray with nonstick cooking spray. Place the peeled and cut sweet potatoes on the baking sheet and drizzle with the 1 tablespoon of olive oil. Give them a generous sprinkle of sea salt and shove them in the oven for 20 minutes. After 20 minutes, take them out of the oven and, using tongs, flip each one over so that they get a nice even tan about them. This seems tedious…but in my years of sweet potato-making, necessary. Stop complaining and just do it. Have a sip of wine. Stretch. Relax. Throw the sweet potatoes back in the oven for about 15-ish more minutes. Keep an eye on them as the higher sugar content can make them burn quicker than potatoes will. 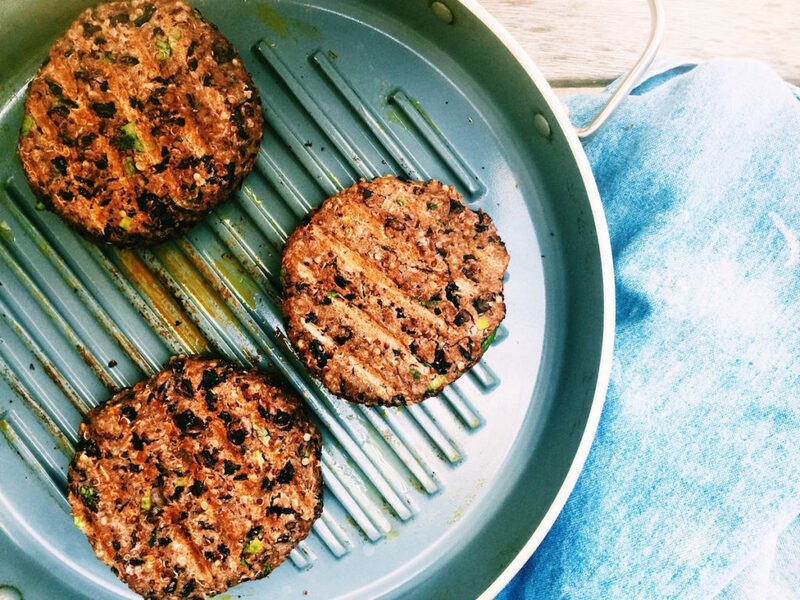 Grab your burgers and start grilling. Cook on a well-oiled barbeque, grill pan or sauté pan over medium-high heat, each side for about 8-10 minutes. I don’t know how your medium-high heat is…mine will get nice grill marks after about 8 minutes. Use that as a guide. When it’s time to flip, go gentle and slow. I use two spatulas to get a good, even flip. But that’s just me. Make sure to toast your buns so they are nice and crispy…you want a firm surface for your burger. Just saying. Smear the secret sauce on the top half of the bun. Add the arugula and avocado to the bottom bun and smash together with the back of a fork. Add the tomato and sprinkle some salt and pepper over the top. Place the burger on top of the tomatoes. Place the pickled onion on top of the burger and then throw the top bun on there. Did you get the sweet potatoes out of the oven, honey? Dinner’s done. How easy was that? I’m excited that they’re going to start labeling GMO free products…but why does this article make the whole thing sound shady? Oh, and JoyTheBaker included this link in her post today. Read it and we’ll fight about the Kardashians. My sister got in an argument (jokingly) with her friend about the Kardashian’s last night. She was defending them, naturally. Another friend’s family came to visit last summer and her husband said, “I’d like to meet someone that actually watches the Kardashians.” I told him the wait was over. Let’s have a couple more glasses of wine, eat veggie burgers and fight over the merits and decline of civilization as it pertains to the Kardashians. I’ll win. And we’ll celebrate with more wine. I’m not really good with the balance thing either and have spent the majority of my life living in the extreme (e.g. workaholic, exercise-aholic etc). Fortunately, this does not apply to my eating habits. It’s great that you can recognize this and get it under control before it negatively impacts your health. That’s not always easy.